Home » Tin » Cigarette box by Grathwohl Kartal, Munich. 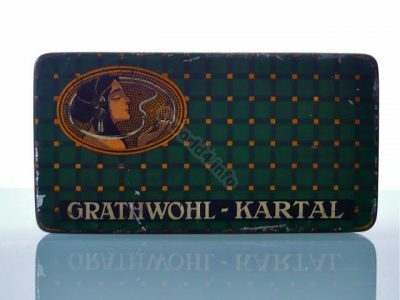 Cigarette box by Grathwohl Kartal, Munich. Cigarette box by Grathwohl Kartal, Munich 1910. Art Nouveau period. Illustration of a smoking girl with an extraordinary hair fashion. The model includes Egyptian design elements, which at that time one of the main growing areas was for tobacco. This rare collectible cigarette box is designed in Art Nouveau style. Next PostAntique Bohemian Autograph 1875. Antique corkscrews, D.R.G.M. Made in Germany.